and yet … we have a poem. Wonderful to see this poem again, and illustrated with such a stunning image. 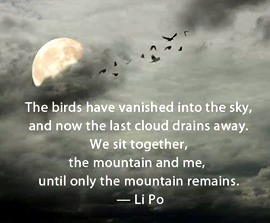 Li Po has always been one of favorite Chinese poets and this one is a stunner. Thanks for posting it Miriam. How can the poet/artist disappear into the world, and yet deliver a message home? Emptiness to Emptiness, via Emptiness. Delighted to hear from you again Claude!